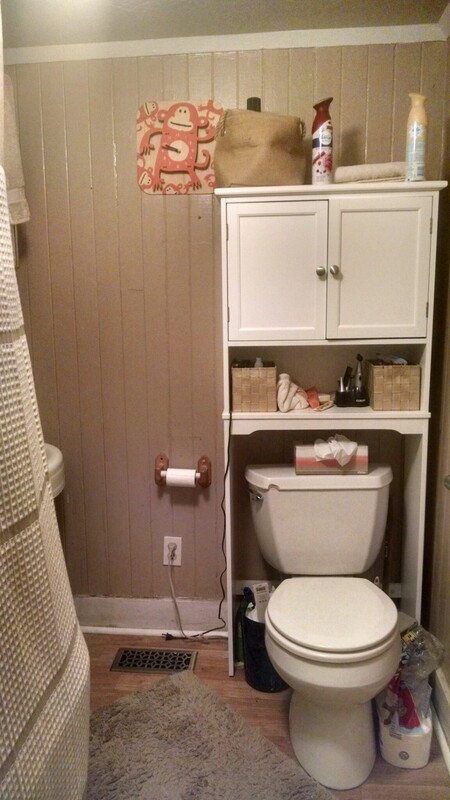 Since I wandered into the eventual bathroom remodel territory on the last post, I haven’t been able to stop thinking about the possibilities and what we could do with the small space in there. It’s just under 50 square feet, there’s only so many places things can go, and it’s so small that I’ve concentrated on keeping things light in there to make it feel less claustrophobic. What is the real potential of this little room? Let’s start with where we are now, with some quick cell phone snaps taken last night. I really need to add a towel hook for by the sink! Oh, and did I mention there’s another door in here? 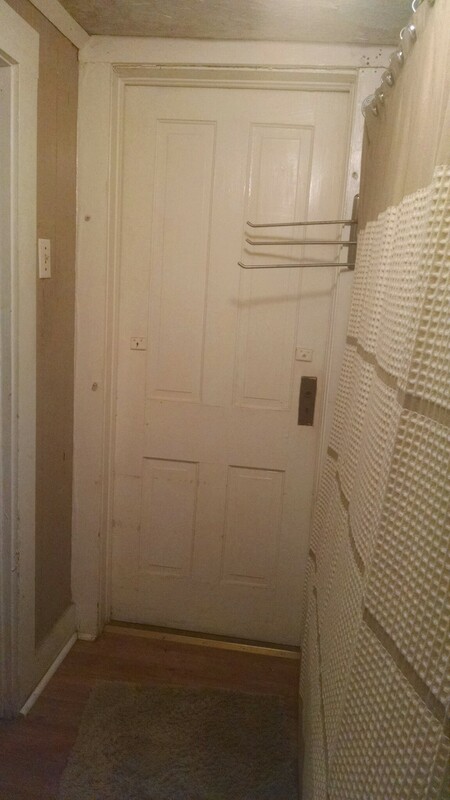 That door, I believe, originally led from the owner’s study/the back parlor to the back porch. Now it’s a completely unnecessary door between my office/studio and the downstairs bath. And, yes, this is where I want the sink to go. While we’ll very likely seal this doorway (functionality wins out over the historical footprint of the house in this case), the fact that it’s already somewhat recessed will be, I believe, a great start for a recessed medicine cabinet above the sink to come. Click the image to go to the current Pinterest Board for this project. At dinner, last night, Todd and I went over some of the things we’d discussed in passing about fixtures and finishes. If you notice the monkey clock in the second photo and I purchased the dancing monkey clock a few years ago through a flash sale site and we’ve agreed to keep it in the room as our accent color inspiration. Everything else will be white or cream/khaki to keep the room bright. The clawfoot tub (currently hidden behind the shower curtain) needs a good scrub with a wire brush and a fresh coat of paint. 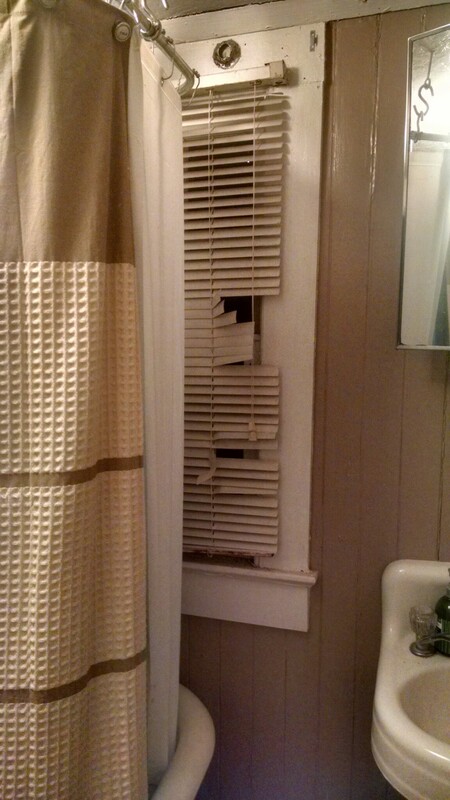 Someone had the questionable idea to add what appears to be a wallpaper border to the outside of the tub in years past, that will also get removed (though if its anything like the wallpaper in the entryway, it won’t put up much of a fight!). We’ll pick up the burnt orange color from the clock in textiles and small accessories, maybe even replace the knobs on the current etagere (just a basic one from Target, but it serves it’s purpose and fits the space nicely) with pretty glass ones like in my polyvore board. Orange isn’t necessarily my favorite color, but I think a little bit here and there would be a nice touch in an otherwise neutral room. Originally I’d thought we’d install in-floor radiant heat in both bathrooms. I’m not sure that’s really necessary downstairs anymore (especially since it’d only be installed in the middle third of the room–less than 20 square feet; you don’t put the heating elements under or too near the fixtures, only in the open areas), though I suppose I could feel differently when there’s ceramic tile on the floor instead of the wood-look vinyl flooring the contractor put in during the bank-required renovations. Still, I think a sizable, colorful bath rug could take care of creature comforts for anyone who actually needs to shower down here. Considering the size of the room, I suppose it’s not surprising that this remodel could be done for less than $2,000 (it’s only a bit over a grand for the fixtures and accessories, but I’m allowing for a lot of the unknowns in my semi-educated guesstimate: drywall and it’s related materials, insulation, the plumbing supplies, and whatever else pops up). Thank goodness it can all be done by Todd and I, as the biggest chunk of any renovation project is the labor. While I’ll be keeping an eye out over the next few months for orange accents at good prices, it looks like I’ll be shopping for a new ceiling fan for my office in the more immediate future. The motor started making a grinding noise last night that’s a bit disturbing. That’s the fun of old houses, right??? haha I love the title of this post! I am super jealous you have a claw foot tub! That is on my dream list! Fun! I love the orange, so bright and cheerful! It’s not usually my top choice, but I think it’ll work well in here. I love the orange! Why have I never thought to use color as my spashes of color! Oh no, I hope your ceiling fan is ok. Sounds like you have plenty of downstairs- bath-inspiration! Good luck. You have great ideas! Thank you! I’m afraid the fan’s beyond help. Good thing it’s starting to cool off (though not quite for good). How fun ~ I love the idea of renovating an old house…but it also scares me 🙂 We opted to buy one that had already been renovated (because renovating with kids underfoot does not appeal!) Enjoy! I love the inspiration pallet! It is going to look great! 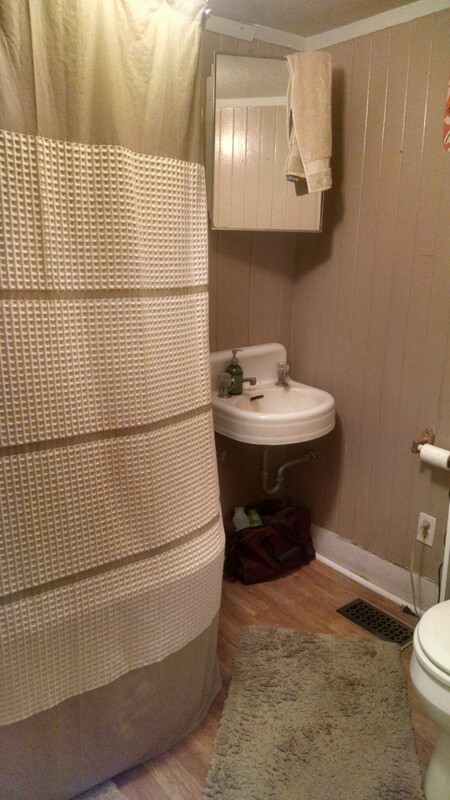 Looks like you pretty much have everything down that you want to do with your bathroom remodel. I like that color orange, and I’m sure you’ll make the finished project look stunning. I like to have as much planned as possible, all the while acknowledging anything can go wrong/need to change. I’ll be curious how much deviation occurs from plan to reality! Love your inspiration board. A must for any project. Can’t wait to see the final product! Thanks! After discussing specifics with Todd this weekend (instead of the nebulous ideas we’d previously discussed), it’s very likely we’ll start on this project in January! Burnt orange is such a great colour choice to add some wanted finesse to your bathroom design. Unconventional maybe but your visitors certainly won’t find it boring. We have tiny bathrooms too. I love the burnt orange color, great idea! Thank you! As much as I grump about how small and cramped the downstairs bathroom is, I’m definitely grateful that it’s there! Love the splash of orange, it’s going to look amazing! Thank you, Michelle! I certainly hope so! Can’t wait to see how this turns out! I’m loving the pops of orange and the monkey inspo!